Mount Rainier is a majestic part of the Seattle skyline. That’s, of course, when you can see it through the precipitation and heavy cloud cover that characterize our weather most of the time. But, this year has been different. We’ve had almost uninterrupted warm and clear weather since May, for us an unimaginably long dry period that has rare historical precedent. Locals could see Rainier everyday. I was admiring it a few weeks back when I thought, “We should go back.” It has been over a decade since the last visit. My wife and I decided to take a short vacation in late July-early August, the kind of road trip where you don’t have any particular itinerary. Go where the wind blows, in a manner of speaking. Our first thought was to head out to Eastern Washington. We’d never visited Spokane or Coeur d’Alene. The weather forecast changed our minds with temperatures predicted to be 100+o F. Consequently, our travel was going to be confined to west of the Cascades. The prolog above pretty much says where we decided to go first. Our approach to Mount Rainier National Park was from the west on WA Hwy 706 (through the Nisqually entrance), which leads directly to Paradise, the most popular stopover in the park. I hardly recognized the place. There was only the lodge the last time we were here. A series of trails led up into the subalpine meadows where I have distinct memories of marmots scurrying around and whistling from the boulder-strewn landscape. Now, the amenities are greatly expanded with the lodge sharing a humongous parking area with the new Jackson Visitor Center. The trails are paved in asphalt. Normally, at this time of year, the wildflowers would be in full bloom, but the unseasonably warm weather forced them to open and expire much earlier. The visitor center was crawling with people as was all of Paradise. If you’re crowd-averse, you’d best avoid summertime. We took a short hike and concluded with a walk through the historic lodge. Nearby is popular Narada Falls. At 188ft in total, it is actually two-tiered, the upper (and longer) portion a beautiful bridal veil that fans out over a steep basalt cliff. From the parking lot, a short trail led down to an observation area that provides the best view of the upper falls. It’s said that when Paradise River is running high, you can expect to get soaked at the viewpoint. Rainbows are a common sight at the foot of the falls when the sun angle is high, like it was for us. We then headed east to Ohanapecosh, in the southeast corner of the park. It too has a visitor center, much more humble than the one in Paradise. Lots of old growth Douglas firs, Western red cedar and Western hemlocks abound on this side of the mountain. We admired some fine specimens in the Grove of the Patriarchs, just past the Stevens Canyon entrance. The Cascade range has several canyons. One of them is Box Canyon that is continually being incised by the Cowlitz River. From a bridge on Hwy 706, you can peer down into its 180-ft depth. We left the park in late afternoon and stayed at the very comfortable Nisqually Lodge in Ashton, just outside the park border. 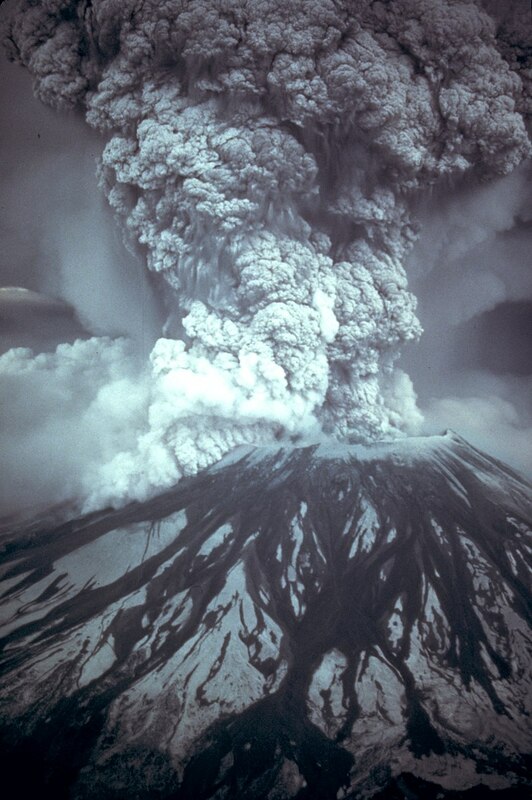 We had never visited Mount St. Helens, even after the eruption of May 1980. I remember seeing the towering ash plume from our backyard when we lived in the Renton Highlands. It was a frightful natural event whose severity you don’t grasp because it happened far enough away that it was a mere spectacle. It would’ve been humbling to see the aftermath of the destruction as soon as visitors were allowed to return several years later. Now 35 years afterward, we thought it was high time to visit the mountain and witness the ecosystem’s recovery. There are three roads into the national monument. The most popular, Hwy 504 on the north side, is the one that ends up at Johnson Ridge Observatory. Along the way, the recovering forest is odd-looking for the uniform heights of the evergreens. They have a hypnotic effect, so unnatural is their sameness. When we got to the observatory, it was hot, easily in the 90s. How could we resist ice cream being sold at a food trailer in the parking lot? As we climbed the stairs toward the visitor center, Mount St. Helens came into view. The observation area takes full advantage of a head-on look at the crater’s north face, much of which was blown away by the eruption. There was little snow on the mountain, a consequence of this year’s extended drought. Vast barren areas still can be seen, victims of the pyroclastic flows that denuded them. It’s a sobering thought that the magma underneath is still seething, ready to erupt anywhere and anytime along the Cascadia subduction zone that underlies the entire Pacific Northwest. Forest recovery. Trees regrowing at the same height. This entry was posted in travel, Washington, West Coast and tagged Box Canyon, Grove of the Patriarchs, Jackson Visitor Center, Johnson Ridge Observatory, Mount Rainier National Park, Mount St. Helens National Volcanic Monument, Narada Falls, Ohanapecosh, old growth forests, Paradise Inn. Bookmark the permalink.